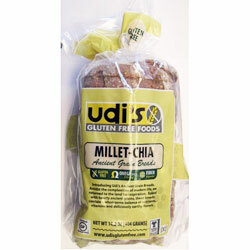 I recently had the opportunity to try Udi's Gluten-Free Millet-Chia Bread. I usually don't concentrate on eating gluten-free foods, but will try them when the opportunity presents itself. Often times I find myself VERY disappointed. Not so with the Udi's Millet-Chia Bread. This bread, baked with with hearty ancient grains of millet and chia, has a base of tapioca starch and brown rice flour. With the addition of the other grains you end up with a bread that has 6 g of dietary fiber in a 2-serving slice, and only 170 calories. There are 5 g of fat per serving. I really enjoyed this bread. It was light and airy, but still had a satisfying "nutty" flavor. It was just perfect toasted with a light spread of butter. This is one gluten-free bread that gets my "thumbs up". If you want to try it yourself, you can get a $1 Udi's Gluten Free coupon here. Disclosure: I receive this bread free from Udi's to review. Any opinions expressed above are my own.